Gallery 247 was started by people who had been involved in the complex task of staging a fund raising art show, staffed by people without any systems other than the energy of volunteers and their "we've always done it this way" mindset. 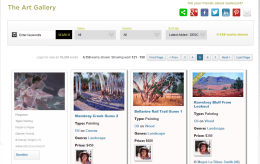 Gallery 247 rapidly became Australia's foremost portal to integrate the needs of art shows and artists. 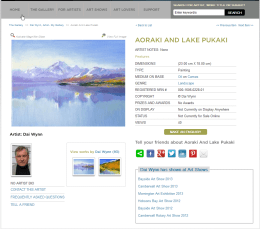 Some of Australia's most important art shows rely on its on line art show entry, assessment and show management system. In parallel, thousands of Australian artists are receiving year-long exposure even when an art show is not operating. With art shows usually relying on the generosity of sponsors to raise funds, Gallery 247 delivers a comprehensive suite of options that deliver significant value and investment returns to sponsors that was simply not possible previously. Gallery 247 had a vision of building a nationally recognised online service for artists and art shows, in such a way that would simplify the process of managing art shows, yet provide continuous value to those artists who rely on art shows to exhibit and sell their work. Artists must be to create and maintain their own portfolios on line. Artists are not necessarily computer literate, and art shows are once-a-year affairs frequently run by service clubs with retired volunteers. It was crucual, therefore, that the system be intuitive and extremely easy to use. Each art show should enjoy their own independent and autonomous website, with sponsor promotions, existing and archived art show galleries and online ticket sales for gala openings. The system was built on our StreamScape Professional business management engine using several standard core modules. These include the content management engine, the customer contact management engine, event calendar, payment gateway, challenge-and-confirm member sign-up facility, newsletter engine and members-only login services. A login and private gallery administration service was developed for artists with a personalised dashboard and private messaging area. Artists have their own public gallery and can enter any participating art show with little more than a mouse click. Each grade of artist has been provided with a distinct mix of services and presentation levels commensurate with their membership grade. Art show administrators have a similar login, with access to a comprehensive range of services and reporting. Art show services that we developed from the ground up include a unique blind pre-acceptance voting facility, so that entries can be assessed for suitability for hanging. An SMS service was incorporated to instantly notify artists of successful entries as well as in-show sales. Art shows can add sponsor and advertiser content at will, which constitutes an important source of revenue for those art shows that are primarily fund raiser events. Gallery 247 has managed to become Australia's foremost artist portal and art show management service. Visitor statistics and search results are exceptionally strong with artists routinely upgrading their memberships to take advantage of the strong exposure that the site offers. Based on the site's rapid acceptance, plans are in place to extend the range of services on offer. Visit www.gallery247.com.au for a closer look. Our entire business is operated and managed on line. We have achieved very high Google visibility in a very short time. We are getting visitors in response to over 1000 unique search terms every month. Much to our delight we didn't have to do any search engine optimisation at all. Traditionally the process of artists delivering and retrieving unsold paintings was a nightmare, often with long queues of frustrated artists and volunteers. Our art show clients are reporting that all that hassle has completely disappeared. Artists are telling us that they find the service extremely valuable, user friendly and, to quote one artist, we have turned the entire art world on its head. Many artists are cancelling their own websites because Gallery 247 is delivering much better results.